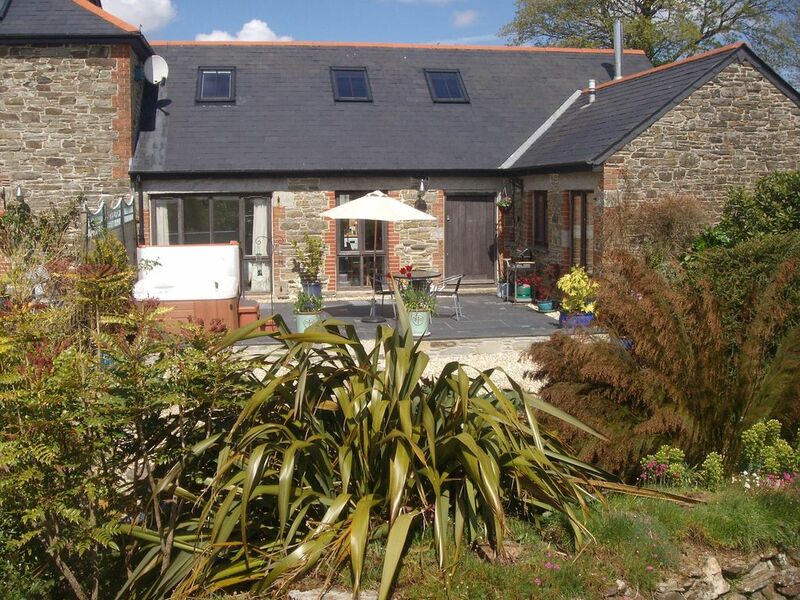 Tamsin's Cottage is a light and spacious barn conversion equipped with modern conveniences. There is a four poster bed in one bedroom. Both bedrooms have en-suite bathrooms. There is a large patio in front perfect for dining al-fresco. The bird feeders in the patio garden are frequented by a variety of wild birds. Solar panels & ground-source heat pump provide central heating and hot water (backed up by electricity from renewable sources). We try to use eco-friendly products where possible. Relax under the stars in the luxury of the hot tub. There are spectacular views of the countryside and valley extending into the distance. Tamsin's Cottage is perfect for a romantic getaway. Dogs welcome. There is a £15 per dog charge payable on arrival..
Coastal towns and villages: Tamsin's Cottage is well placed for many beaches, towns and villages on the coast. Looe, Polperro, Lerryn and Fowey are all close by. The National Trust beach of Lansallos is a short drive away. Eden Project: The famous Eden Project is 30 mins drive away. Gardens & Stately Homes: Lanhydrock House is one of the National Trust's more popular properties is only 20 minutes drive. The famous Lost Gardens of Heligan are within easy reach. Christine & Roger have recently retired. We have tried to provide a high quality accommodation for guests to relax and to enjoy the tranquil surroundings. We stay in the background but are available for advice and assistance if needed. Central heating from ground-source heat pump, solar panels/ renewable electricity. Ample parking space. Possibility to recharge electric vehicles if needed (£5 per 12hours). Olive oil, salt, pepper, coffee, tea,, milk provided. Very clean, comfortable cottage and we thoroughly enjoyed our week. The cottage really is a home from home and extremely well equipped with everything you could possibly need. The scones and cream on arrival is a lovely touch. With the added luxury of the hot tub this really makes the cottage value for money. Due to being a little off the beaten track it is really quiet and relaxing but not too far from the numerous places to visit and being in the centre of Cornwall gives you an ideal place to explore what Cornwall has to offer. Roger and Caroline are friendly and welcoming but not overbearing and obviously work hard to create a good standard of holiday home. Very homely, and everything you could need has been careful thought of. Lovely location. Amazing stay, made to feel homely. Tamsin's Cottage nestles on a hillside surrounded by meadows and woodland with distant views down the valley.